The SPro is a highly portable all-in-one projector with Android 4.2 that delivers images up to 10 feet (3m). When the projector is off, the SPro can also serve as a power bank to charge your other gadgets. For those who don't need a 4G LTE connection on their mobile projectors, the WiFi-only ZTE SPro is now available as a follow-up to the $450 (£305, AU$590) Sprint LivePro. Like the LivePro, the ZTE SPro is a compact all-in-one pico projector. At $400 (£270, AU$530), the LivePro ships with Google's Android operating system, a capacitive touchscreen to control the projector, speakers, and a built-in battery. These features allow the traveling professional to conduct impromptu presentations without requiring a bulky setup such as a laptop, a larger and heavier mobile projector, and all the cables and adapters needed to wire everything together. As an all-in-one unit, you can pull your files from the cloud through apps like Google Slides, connect a Bluetooth mouse to control your presentation without having to reach for the touchscreen, and wow your audience. The projector takes up little space with its compact 4.7 x 4.7 x 1.1-inch (120.6mm x 120.6mm x 28.5mm) footprint, making it ideal for small spaces when you're on the go. And if you have any downtime at home or back at the hotel, the full Android OS allows you to download multimedia apps such as YouTube, Netflix, HuluPlus, or Sling TV, and project your video to a blank wall. This makes the SPro a versatile tool that's great for work and fun. At just 14.1 ounces (400 grams), the SPro is lighter - and smaller - than most mobile projectors on the market today. For comparison, the $599 (£385, AU$738) Epson EX7235 Pro weighs 5.29 lbs (2.68 Kg) and measures 11.7 x 9.0 x 3.0 inches (297.2 X 228.6 X 76.2mm). The Android feature of the SPro makes it similar to AAXA's $555 (£360, AU$708) LED Android projector. The AAXA unit is most similar in size to the SPro, measuring 5.9 X 5.2 X 1.4 inches (149.9 X 132.1 X 35.6mm), but it weighs more at 1.5 pounds (0.68kg). The S Pro is encased in an unassuming black box with ribbed plastic sides and a touchscreen panel on top. The design isn't unattractive, but it feels a bit too buttoned-up, especially when compared to the silver Vivitek Qumi Q5-RD with red trim. 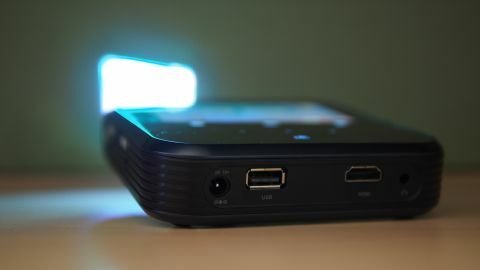 The front of the device features the ZTE logo and has the opening for the projector to shine through. On the left side, you have a silver wheel to focus the projector, a slot for a micro SD card slot, the power button, and also a button to activate the projector's battery. When you activate this second button, the projector serves as a power bank and you can plug your smartphone or small gadget into the USB port on the rear to charge devices on the go. On the rear, in addition to the USB port, you have a port for the charging cable to charge the projector, a full-sized HDMI port, and a 3.5mm audio-out port. The right side of the device is clean, except for a concealed vent opening. On the top panel is a 4-inch WVGA resolution (800 X 480-pixel) touchscreen along with capacitive touch Android navigation keys. The touchscreen allows you to use the projector as a handheld Android device without having to turn on the battery-draining projector lamp. Just below the Android navigation keys are capacitive buttons to navigate the projector. There are volume buttons, a circular button to toggle the Android display on top, and a button to fire up the projector lamp. Four rubber feet on the bottom of the projector enable you to place the device on a smooth surface without worrying about the unit sliding around. A small speaker is embedded on the bottom. There is also a pull-out plastic kickstand that allows you to angle the projector, and a tripod mount for better height control.